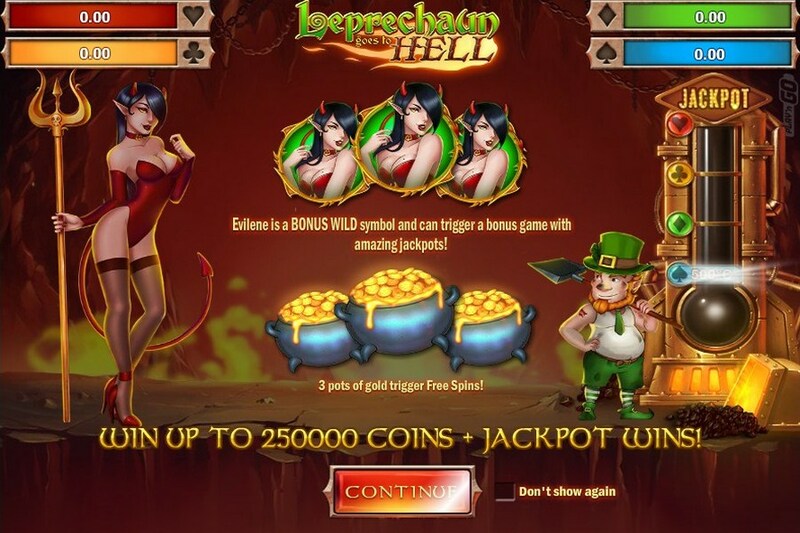 Leprechaun goes to Hell is a jackpot slot machine game by casino software developer Play'N Go that has 5 reels and 25 paylines and is available across all devices from 25p per spin. Based on leprechauns in hell, there are 2 wilds symbols which combine to double your wins. There’s a Free Spins feature where up to 50 free spins with a 10x multiplier can be won. The main attraction is the Infernal Bonus feature where you can get up to 50 Infernal Spins – the Leprechaun is a wild. When you get wins, it increases the temperature of the thermometer to trigger 1 of 4 progressive jackpots. 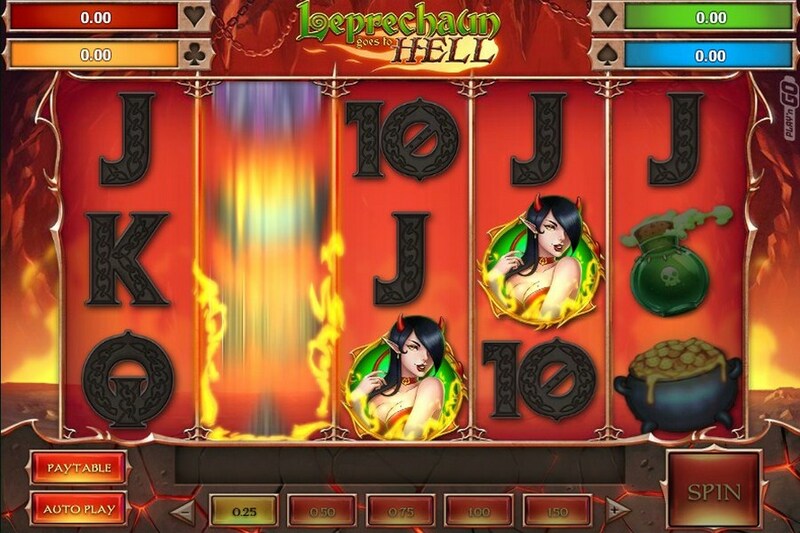 Slots symbols on the reels include the wicked she-devil (named Evilene), a peppy Leprechaun, bubbling potions, melting pots of gold and pentagrams – it looks fantastic. The slot machine game benefits from 2 wild symbols – Evilene and the Leprechaun. They substitute for any other reel symbol of slot, except the scatter, to form winning combinations. If both Evilene and the Leprechaun are part of a winning combination, your win will be doubled. There is a Free Spins feature which is triggered when 3 pot of gold scatters appear anywhere on the reels – this will give you 10 free spins with a 2x multiplier (i.e. wins doubled). Look out for 3 scatter during the feature as this gives you an additional 10 free spins and increases the multiplier by 2 (to 4x). You can do this a few times with up to 50 free spins available with a multiplier of 10x! Then there is an Infernal Bonus feature which is played when 3 Evilene symbols appear anywhere on the reels. You are then award 10 free Infernal Spins. Look out for special heart symbol landing on reel 3 (the middle one) as this gives you additional Infernal Spin – there’s up to 50 Infernal Spins to be won. Furthermore, the Leprechaun acts as a wild symbol which will boost your chances. Now, the game changes into a blazing 3-reel slot machine with 5 fixed paylines – here is where you can win the progressive jackpots. You can do this with winning combinations which increases the temperature of the thermometer. There are 4 levels of sizzling jackpots – the higher the temperature, the bigger the jackpot you can win. Furthermore, the higher your stake, the higher your chances of winning the top jackpots. 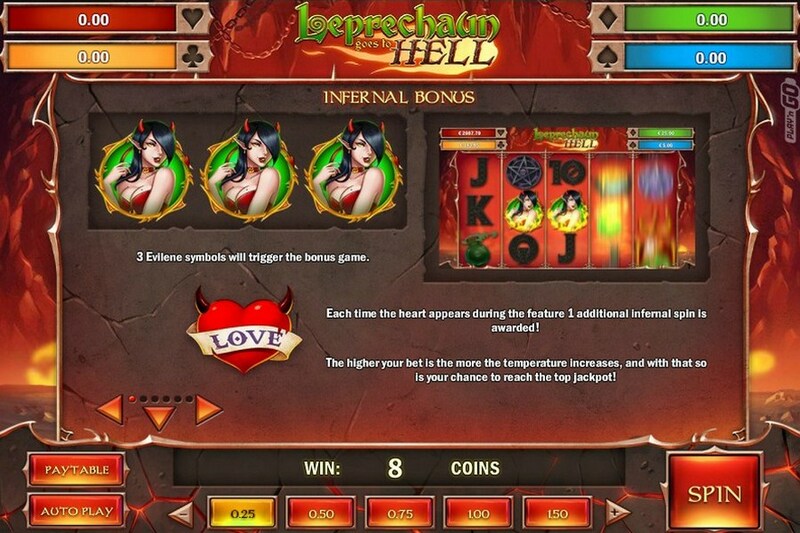 Apart from an unusual theme with exciting features you will find some high end 3D graphics, amazing animations and heavy soundtrack which perfectly complements the hot atmosphere in slot machine game Leprechaun goes to Hell.